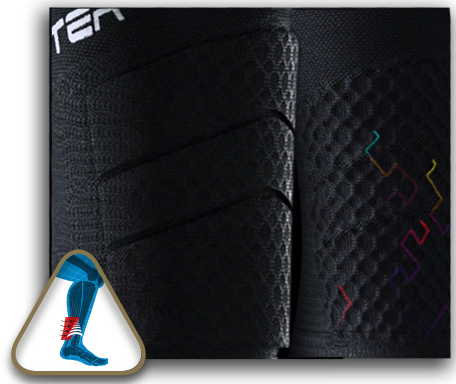 The new compression calf sleeve has been designed using several types of mesh (ultra-flexible/flexible/semi-rigid/rigid) to exert specific pressure on the calf, shin and ankle. The SHOCKWAVE EFFECT, the major innovation on the entire BOOSTER Elite Evo2, reduces up to 42% the vibrations and muscle oscillations produced by the shock wave that is created by each impact of the feet on the ground. The combination of these innovations allows a 39% reduction in post-exercise muscle aches. 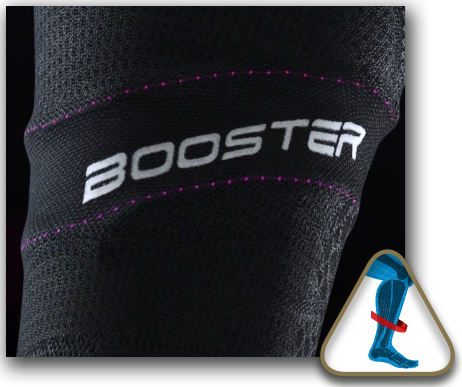 The BOOSTER Elite EVO2 combines the latest textile innovations and BV Sport's several validations and scientific studies. 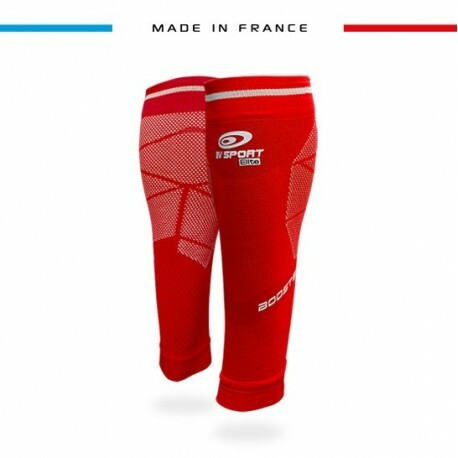 The CALF SUPPORT unique compression principle patented by BV SPORT and targeted at the calf, significantly improves venous return, enhancing muscle, tendon and ligament's oxygenation. 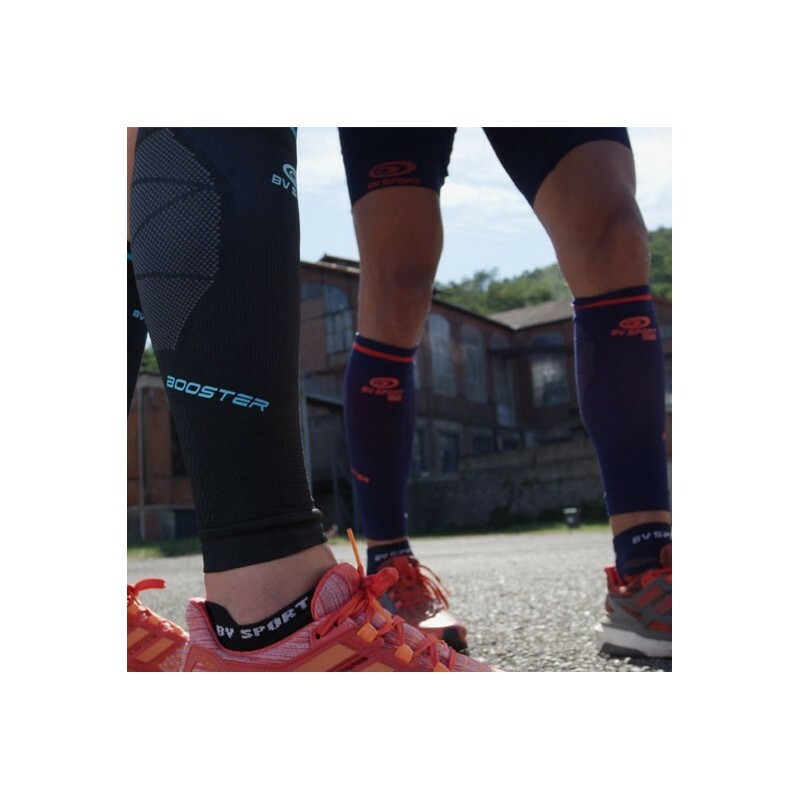 Regular use of the BOOSTER ELITE EVO2 delays the onset of heavy legs, increases the threshold for fatigue, reduces the risk of muscular aches, considerably lowers the risk of injuries and muscle damages and prepares the body for recovery from the outset. 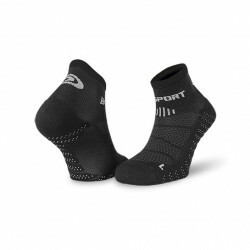 Technology : Alternating ultra-flexible and rigid mesh for better cushioning and shock absorbency. 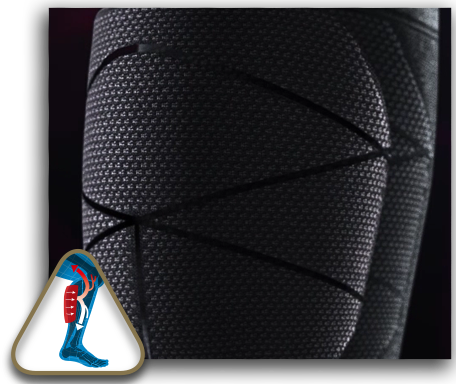 Mechanism of action : This new knit technology is used across the whole of the BOOSTER ELITE EVO2 and dissipates the shock waves generated from the impact to the limb during weight-bearing. Benefits : Significantly dampens unwanted vibration and oscillation, which cause muscle damage and injury (periostitis, tibial fractures, DOMS). 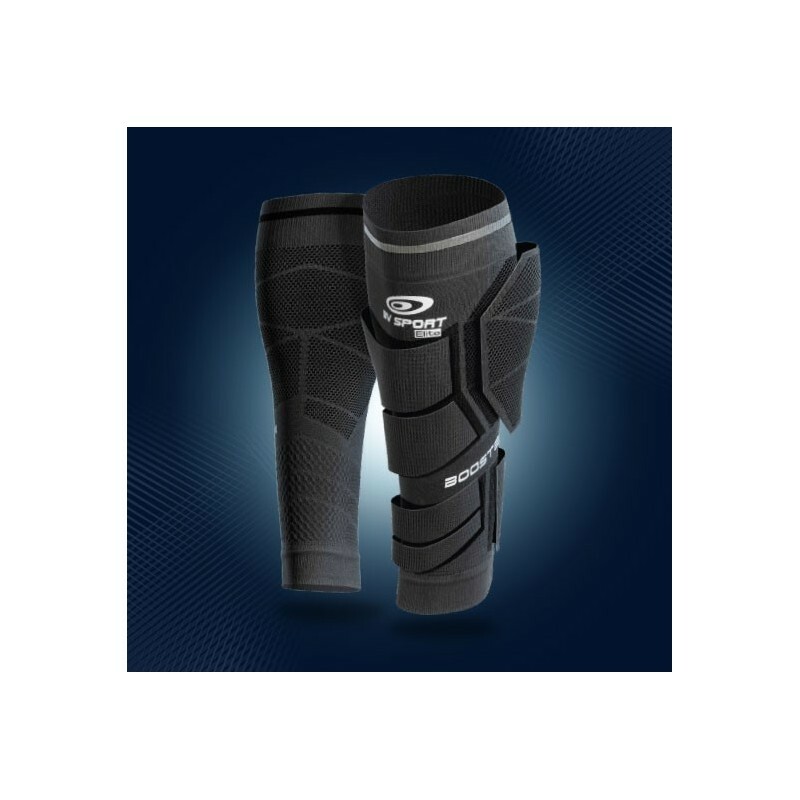 Technology : Targeted pressure and rigid mesh for the calf. Mechanism of action : Improves venous return and accelerates the elimination of toxins (CO2, free radicals) accumulated in the calf. 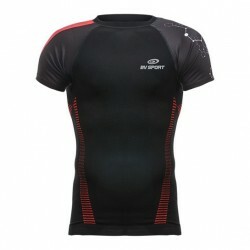 Dampens muscle vibration and oscillation. Benefits : Delays heavy legs and increases the threshold for fatigue. Reduces the onset of periostitis and DOMS. Technology : Flexible and Aerated mesh positioned over the tibia. Mechanism of action : Protects the sensitive pre-tibial structures (periostium, superficial nerves and microcirculation). Benefits : Greater comfort and perception. Reduces the onset of periostitis. Technology : A cellular 3D mesh for greater Achilles tendon support. Mechanism of action: The cumulative effect of the 3D Socket and Shock Wave meshes disperses muscle vibration and oscillation thanks to its cellular structure. 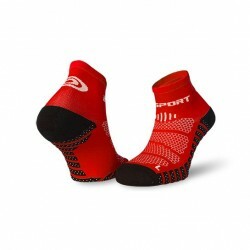 Benefits : Reduces the risk of Achilles tendon inflammation. Technology : Semi-rigid mesh positioned to support the anterior tibia and triceps surae (lateral/medical gastrocnemius and soleus). Mechanism of action : The Tap Control mesh supports the tendons of the triceps surae and anterior lower leg. Benefits : Reduces the risk of tendinitis and injury and improves muscle efficiency during weight-bearing, especially on uneven surfaces and inclines. 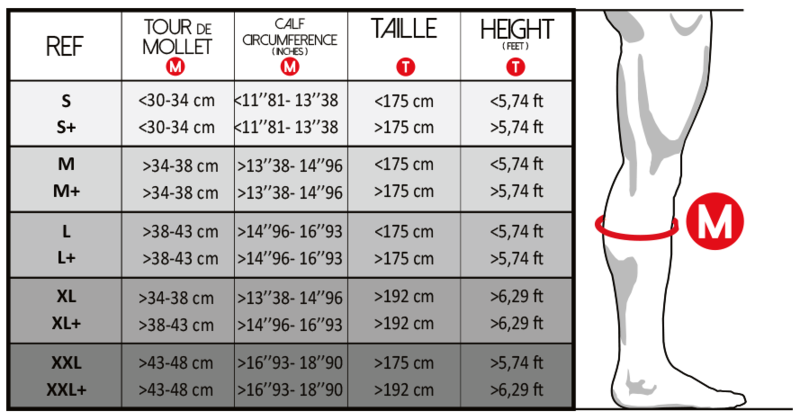 Technology : The BV SPORT Research & Development Centre has conducted numerous scientific studies proving that pressure transmitted to the leg varies based on the type and thickness of the living biological tissue. These tissues either act as pressure absorbers (muscle and fat) or are non-compressible (bone and to a lesser extent the tendons and nerves). We have used these innovative parameters to design a range of meshes (ultra-flexible/flexible/semi-rigid/rigid) which, since 2004, have been incorporated into the design of our Booster and ProRecup compression ranges. Mechanism of action : Selective compression respects the anatomy and physiology of the athlete’s body, improving venous return, optimising muscle performance with every impact and significantly dampening unwanted vibration and oscillation. 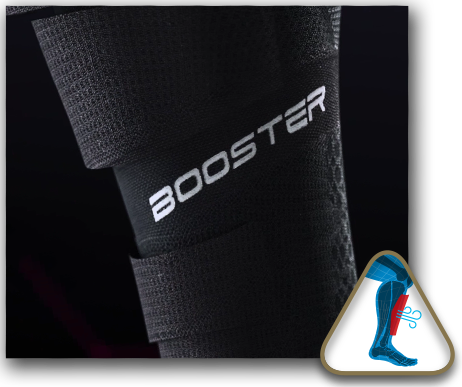 Benefits : Regular use of the BOOSTER ELITE EVO2 delays the onset of heavy legs, increases the threshold for fatigue, reduces the risk of aches, considerably lowers the risk of injury and muscle damage and prepares the body for recovery from the outset. See clinical studies. Never USE your Booster during the recovery phasis. During your trips in car, bus, train, flight and when sleeping. - In cas of venous pathology, contact your doctor.